Born and brought up in Calcutta, India Amit was exposed to the arts, literature and cinema from an early age. He was hugely influenced by the films of Satyajit Ray. His passion for creative arts flourished with his years of training and performing the Indian classical dance form of Kathak and musicals. He also published two books of poetry, dance dramas and plays. Two of his recent plays achieved huge acclaim and success in India. Amit came to the UK in 1997 to further his medical career, however he continuously wrote, directed and performed in musicals, dance dramas and stage shows. He also started exploring world cinema, as a new creative canvas and a way to express himself fully. 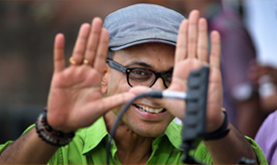 He trained himself in the Raindance Independent Film School and started making short films, awareness films and documentaries. He received a grant from King’s Find and Millennium Commission’s Leadership award from the Mayor of London for a film raising awareness on autism. His first short film One Short Sleep Past was shown at the Kolkata International Film Festival. Bridge is Amit’s debut feature film, made with a shoe string budget with a bunch of highly dedicated and passionate international cast and crew. Amit lives in London and works as a consultant child and adolescent neuropsychiatrist and ex honorary senior lecturer. He leads a specialist multidisciplinary mental health team. His vision is to make films that transcend cultural barriers, usher in personal and social transformation and will further the full realisation of human potential.